Across the tumbled lands between, the mountains of the Ephel Dúath frowned at them, black and shapeless below where night lay thick and did not pass away, above with jagged tops and edges outlined hard and menacing against the fiery glow. Away to their right a great shoulder of the mountains stood out, dark and black amid the shadows, thrusting westward. The Ephel Dúath or Mountains of Shadow are the western defense of Mordor. After the victory of the Last-Alliance Gondor built several fortresses and watchtowers here to oversee the land of Mordor. Isildur built Minas Ithil, the beautiful tower of the Moon, "high on a rocky seat upon the black knees of the Ephel Dúath" and lived there. But the power of Gondor dwindled, the fortresses has been unguarded for a long time and evil thing crept back into the area. The Nazgul conquered Minas Ithil and turned it into the pale Minas Morgul, the tower of Black Magic. 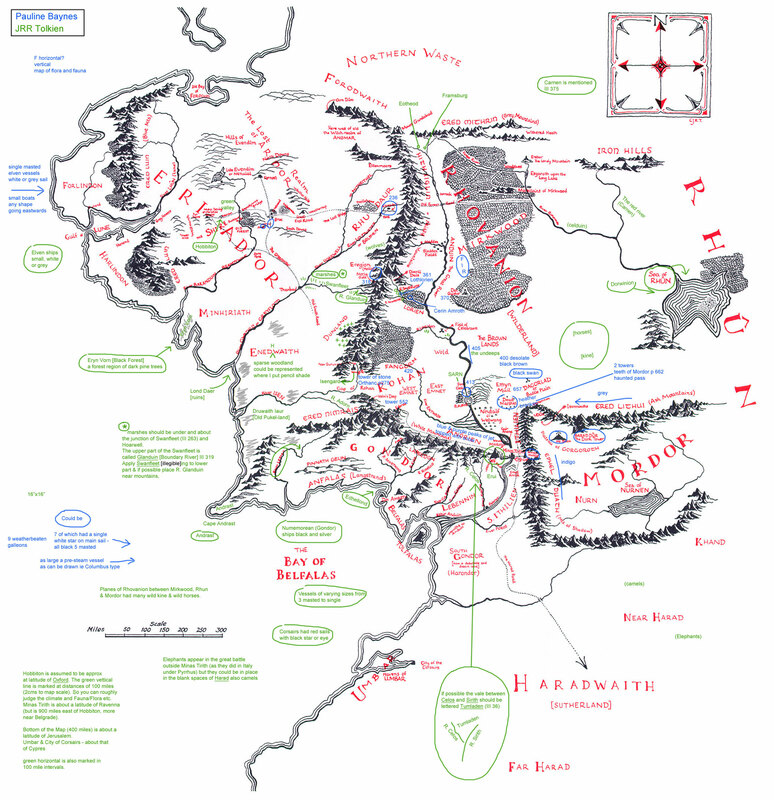 The path of Frodo and Sam through the Ephel Duath was described by Tolkien at incredible level of details. The terrain generated by @Tyranystrasz using World Mashine is a great base, but doesn't include all the small scale details. Thus the first goal of this project is to at those terrain details. In a second step the streams, vegetation and roads as well as the few buildings in this area will be made (Minas Morgul, Castle of Durthang, one or two small orc-fortresses in the Morgai valley, Stairs and Tower of Cirith Ungol, Shelob's lair, Morgul Road to Mordor). The map show the main working areas, below are descriptions what to change in those areas. For an epic Minas Morgul build a lot of space is needed (Building the tower itself is a separate project). After some discussion about the size of Minas Morgul a large valley expansion at a height level of y=50 has been created. This required to reshape the Morgulduin valley down into Ithilien to the Cross-road. All the fine scale details of Cirith Ungol (the stairs, Shelob's Lair, the tower and the path down to the main road) need to be added to the terrain. Tolkien described this very detailed, for example from which locations the highest Tower window is visible. The main road from Morgul to Mordor crosses the Morgai valley on a bridge, this requires to make the Morgai valley quite narrow at this place. At the current terrain the Morgai valley doesn't has an exit but a small stream flowing down which seems unrealistic, thus a valley exit south of the main pass was created. At the northen end of The Morgai the valley floor should raise and the height of the Morgai should lower to almost the same height as the valley floor. The valley should end direclty at the road down from Castle Durthang to Isenmouthe. At the current terrain there is a huge moutain at level 200+ in this area instead. Also there is almost no space to place Durthang. I suggest to move Isenmouthe (outside project area) about 150 blocks to the south. This would create more space for Durthang. This area is mainly at low height level, lower than the Morgai valley, but here should be the impassable main ridge of Ephel Duath. The east face of the Morgai ridge is a 1500 steep fall to the Plains of Gorgoroth which forces Frodo and Sam going north all the Morgai valley. The current Morgai has a not too steep eastern face. The current terrain has pass here at much lower height level than the Morgul pass which should be closed. The volcanic Mountains (Air, Tibesti and Hoggar) in Sahara desert are a good for inspriation in my opinion. The climate of Ephel Duath is less arid than in the Air, but it fits well with the description of black, jagged rocks.